"This Lithuanian family recipe from the old country makes an awesome summer soup! Serve with warm Yukon Gold potatoes." Place the eggs into a saucepan in a single layer and cover the eggs with water by 1 inch. Cover the saucepan and bring the water to a boil. Remove from the heat and let the eggs stand in the hot water for 15 minutes; drain. Cool the eggs under cold running water in the sink. Peel and chop the eggs. 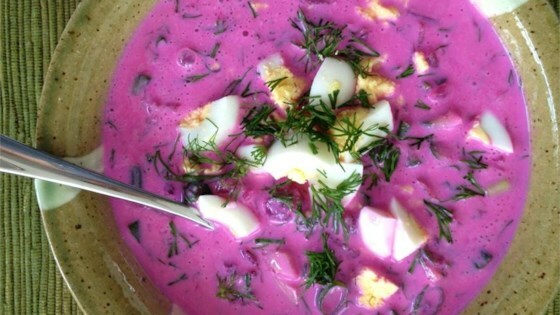 Pour the buttermilk into a large bowl; add the eggs, beets, cucumber, chives, and dill. Stir gently to combine. Chill in refrigerator for 1 full day before serving. Substitute 3 cans small beets if preferred. Looks better than it tastes. May try again in a smaller portion using canned beets. this soup is delicious!! i enjoy eating it with a side of boiled potatoes, just like grandma served it! !